​Bonbousquet is a privately run estate offering yoga classes, peaceful getaways and retreats in the heart of The French Midi-Pyrenees. Located on the edge of the quaint Les Cabannes village, which forms part of the Tarn department, we are less than 1 ½ hours’ drive from Toulouse. The area is one of the prettiest of the region, famous for its stunning natural landscapes, vineyards, traditional white stone houses and medieval villages. 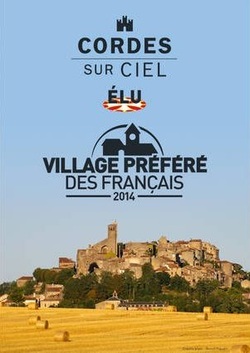 Voted France’s favourite village in 2014, the 13th century bastide town of Cordes-sur-Ciel lies on Bonbousquet’s horizon and other spectacular medieval towns such as Albi, Gaillac, Castelnau-de-Montmiral, Penne, Najac and Villefranche-de-Rouergue are only a short distance away. ​This compelling blend of nature and history can be found at Bonbousquet itself. The 50 acre estate boasts wildflower meadows, oak woodlands, a private lake and a panorama of breath-taking views. At its centre the 350 year old farmhouse stands proud following the ten years of redevelopment that saw the restoration of many of the building’s original 17th century features. As a result a great deal of character and charm has been maintained throughout its transformation into the comfortable, stylish and eco-friendly property it is today. ​Yoga and symbiosis with nature (permaculture) are at the heart of the Bonbousquet ethos. Regular Iyengar classes and workshops are held in our beautifully bright and spacious yoga studio. Led by Joanne Robertson who has 30 years of teaching experience, the classes are enjoyed by local residents, Bonbousquet’s guests, and visitors from far and wide. An organic vegetable garden has recently been established and is now thriving as are the Bonbousquet flock of chickens and sheep who are allowed to roam freely over the Bonbousquet landscape which is in the process of being naturalised. ​This immersion with nature creates the wonderfully relaxing and nourishing atmosphere found at Bonbousquet. Whether you are here for a yoga class, on holiday or as part of a retreat you are guaranteed sense of peace and well-being throughout your time with us. With that in mind we look forward to welcoming you to Bonbousquet.